People were used to seeing the two silver haired men occupy the same bench every evening in the park. Sharing similar thoughts on almost everything from politics to sports, Sharma and Chatterjee seldom argued. But today Chatterjee was in a sullen mood. Mr. Sharma had been born blind but seemed to have an uncanny insight into situations and people that the well sighted often fail to possess. Mr. Chatterjee was a retired pensioner. 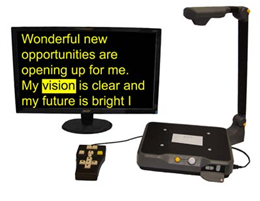 He had just come back from the Eye Doctor’s and had been told that he suffered from low vision, meaning that no medicine, glasses or surgery could now improve his sight. What is worse? Never having experienced the pretty designs on a butterfly’s back, the riot of colours in the sky at sunset, the breath taking view of a tree in bloom like Sharma? Or having seen all of these and experiencing your vision fade away slowly, knowing that you may never see all these ever again like Chatterjee? • Shadows: While your area of activity should be bright, the entire room should also be well illuminated to minimize any shadows. Using lamps on both left and right sides will help reduce shadows. Move your lamps closer to your work. • Glares: Position it onto your side rather than directly in front to avoid glares. Have bare light bulbs covered with shades. Soften bright lights coming in through windows with sheer curtains or blinds. Cover or remove shiny surfaces like table tops and floors. • Lighting: All rooms should be kept evenly lit. Try not to go immediately from a brightly lit room to a dark one. Have stair cases and railings generously lit. • Organize: Use labelled shoeboxes, rubber bands over similar bottles and transparent storage bags to separate important things that you require everyday like medicines, doctor’s prescriptions, important documents etc. a. Telescopes: Telescopes assist with distance vision. The closer the telescope is held to your eye, the larger your field of view becomes. Hence, telescopes that are worn are better than hand held ones. Apart from cosmetic reasons, these may not be favoured because they may provide a narrower (though clearer) view. This can also disturb spatial judgement since the object appears closer than it is. However, these can be very useful for tasks requiring distance vision like recognizing faces at a distance, reading bus numbers, watching television and sports events. b. Magnifiers: These can be hand held, mounted on stands, attached to spectacles, have glare control devices and be illuminated for better contrast. Spectacle magnifiers provide the widest field of view and leave your hands free, but they need clos working distances. Hand held magnifiers are portable, easily available and inexpensive. They need to be held at the appropriate focal distance, cannot be used by people having hand tremors and can give rise to arm fatigue. 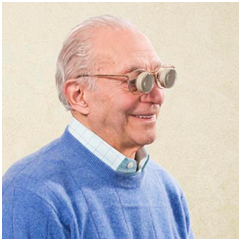 Stand magnifiers are useful for those with tremors and have a fixed focal distance. But they may be inconvenient to carry around and may result in poor postures. Glare Control devices like tinted sun glasses with side shields or tinted clip on sun glasses help prevent the scattering of light. Video Magnifiers project printed material on a monitor or computer screen. This is costlier but does not add weight to your nose like spectacle mounted magnifiers and does not make you lean over your table. Reading lamps, reading stands, writing guides, needle threaders, bold line papers, felt tipped pens, wallets that have separate pockets for different currency notes depending on the denominations, voice recording electronic organizers, large numbered clocks, cards, watches, telephones, etc. can assist you in your daily activities.